Here's a bare start at the many single-track trails available near the intersection of Divide Road with Montrose County Road 90. Update: On the map I mark one trail as not knowing the name. Simon provides the name: Parallel Trail. See his comment below. When it’s dry and summer (a condition that hasn’t been met much the past month or so), the place for truly wonderful single-track trails through beautiful forest is atop Uncompahgre Plateau right around where Montrose County Road 90 intersects Divide Road. I barely scratched the surface in the few hours I was up there on July 5th, 2010. To get there, start at the corner of Main and Townsend in Montrose. Travel west on Main Street and follow the signs carefully to stay on Colorado Highway 90. The numbered highway takes some rather sudden and unexpected turns. After winding past an electrical substation and some very pastoral farmland, the pavement ends. So does Colorado Highway 90. From here it’s Montrose County Road 90. The road is wide and passable by any vehicle. Follow the road to where it enters the Uncompahgre National Forest. The very first trail shown on the GPS, Buck Trail, starts immediately, as in zero feet beyond the boundary. I took the trail north. It’s generally what I’d call beginner++, but parts are intermediate-minus to intermediate. There’s one scree-filled steep climb that has an abrupt right hand turn at the top—that took a try or two. You’ll find “the knob” at the northernmost part of the trail—it’s a rise with a fantastic view to the north, as you can see in the following picture. The view never ends. That's Grand Mesa in the upper right, and straight ahead you can see the bluffs behind Grand Junction. 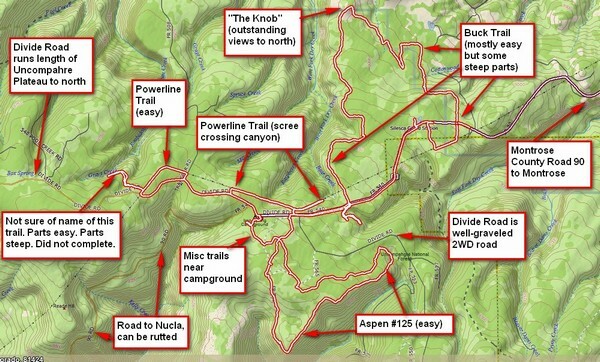 The next trail I tried was Aspen, a trail I traveled several times last year. I rate it beginner+ because of a couple somewhat steep parts. The very first time I tried it last year I thought it was hard, but that was only a few weeks after buying the motorcycle. I went back a few weeks later and wondered what the problem was! This year I found the trail to be quite easy, not to mention beautiful. As its name would imply, it travels through aspens. You can see in the following picture what a single track really is. 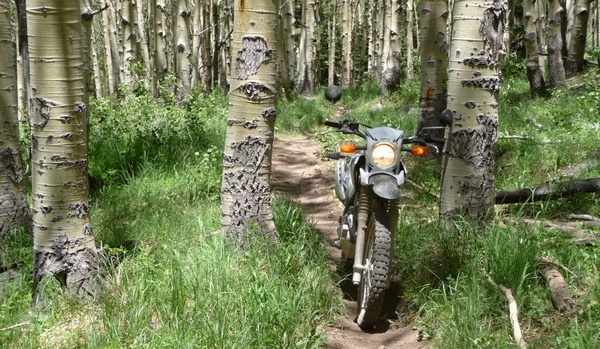 My bike leans on an aspen. The trail is less than two feet wide. Single track trails mean exactly that--just a single track. They're open to hikers, horses, and motorcycles. Just for fun, I captured a little video. I have a Joby tripod that can be bent to grip anything, in this case a handy tree. The video is quite short, but gives you an idea what riding a single-track is like. I poked around a few other trails, such as trails under the powerlines. I also tried a trail that takes off from one of the powerline trails and heads northwest to sort of parallel Divide Road. 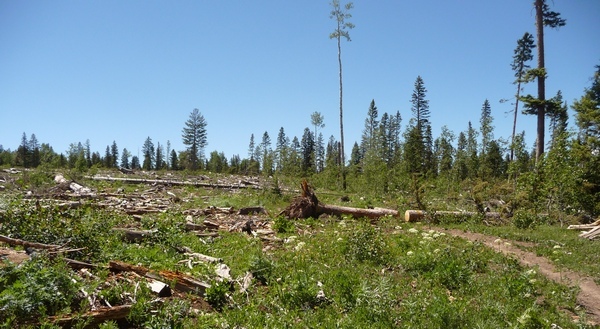 It went through an area of forest that had been clearcut, as you can see in the photo below. Here the trail takes off through some forest that has been clear cut. You can see the trail on the right, plus where crews had to use a chain saw to cut through the log. Now I don’t mean to be political, but don’t ever tell me that a few motorcycles on established trails cause damage, because it’s nowhere near what these clear-cutters did to the forest! It looked like a veritable moonscape! I went down the trail for awhile but found a spot where it went down steeply into a draw. I was pretty tired at that point, so I turned around. I did some thinking later, wondering why I always got so tired. So I’ve been trying a different approach since. I take a bunch of candy bars, and every hour toss about 100 calories of the sugary chocolate into my mouth. It keeps my energy up all day! I fully intend to head back up to the plateau, but I really would like the rains to stop for awhile so the place can dry out! This entry was posted in GPS Tracks, Montrose County, Motorcycling, Video. Bookmark the permalink. Simon–sorry, no, though I wasn’t looking for them. Yeah, there isn’t too much information about this area on the internets. Did you see any Tabeguache Trail signs while you were out there? Thanks! Simon, to find the “unnamed” trail, I went along the powerline a bit and it was on the left in an area that had been clear-cut. Thanks for pointing out it’s called the Parallel Trail. It’s easy for the first part, then makes a steep decent into a canyon–I would presume you could carry your mountain bike across this. I appreciate the additional information you provided–that’s what the web is for! After having looked at your map above a little longer, the trial you don’t know the name of is indeed referred to as Parallel trail on Bing maps. Check it out, it suppose to go all the way to East Bull Creek rd. The first half of it looks pretty nice judging from your pics. Thanks again. Hi, I am planning on biking the Tabeguache Trail coming up soon and ran into your site looking for information. Is the section of trail that your are talking about here kinda of near where Tranfer Rd intersects with the power lines and Hwy 90 and then cuts off to the right just after you go under some power lines? Its referred to the Parallel Trail on Bing maps. I am guessing you turned around before the trail goes down into the drainage. Anyway, I was wondering how the trail is marked, if at all. Any help would be great. Thank you!